Former Hollywood Exes star Andrea Kelly joined The View to discuss the sexual abuse cult allegations of her ex-husband R. Kelly, and added a few allegations of her own. 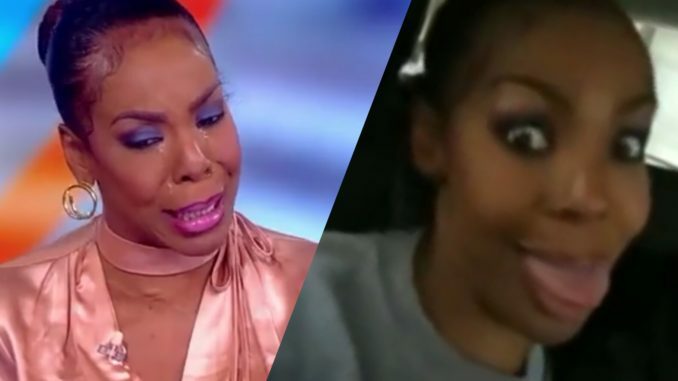 During her tearful interview, Andrea recalled, on separate occasions, being choked by R. Kelly in the backseat of a Hummer; and being hogtied on their bedroom floor and left there while R. Kelly slept in the bed. Many viewers sympathized with Andrea after watching this interview, but it was her actions just moments after filming that had one blogger questioning Andrea’s motives. Before she could wash her interview makeup off, Andrea sat next to her personal assistant Tony Harper on Instagram Live dancing, singing, and boasting about her View interview just moments after, says one blogger. She then told viewers she was heading to a publishing meeting immediately after the interview to secure a book deal. Andrea also explained why she still keeps her husband’s last name 9 years after they’ve divorced. Andrea says her last name gives her a platform to “save lives”. The blogger also captured another interview by Andrea on R. Kelly. At the time, the two had been divorced for several years and Andrea was asked what she thought of R. Kelly’s performance at an award show. Andrea told viewers to keep buying R. Kelly’s music and buying concert tickets because that’s how she keeps her lights on. A far cry from her recent interview where she stated R. Kelly doesn’t help financially support any of their three children. It’s important to note here that the blogger does not doubt that Andrea has been abused, but she seems to question if Andrea’s admission, coincidentally during the #MeToo movement, is nothing more than a money grab.